TAGUIG CITY, Metro Manila – Civil Defense: The Strategic Humanitarian Crisis Board Game is a table top board game of long term strategy and quick tactics that complements the need of Disaster Risk Reduction Management Training Officers for an effective engagement teaching tool for humanitarian response coordination by providing world class table top simulation games that are fun and interactive unlike current training methodologies that are manual based and technocratic. 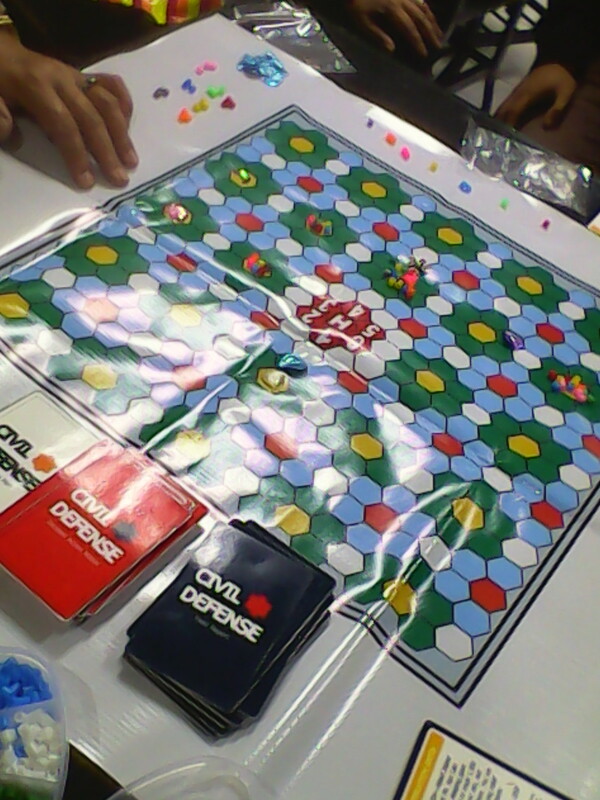 Last, October 26, 2015; the first prototype of the board game was played among a group of graduate level students from the University of the Philippines taking up a course on Environmental Hazards and Disaster Management as part of the alternative teaching methods for the Geography class. The game was played for 1 hour and 30 minutes, participated by 12 students taking their masters or phds from different sectors. Everyone had a great time playing the game and would like to do it again. The players, based on their feedback were able to appreciate the realness and “funness” of the board game. After the time ran out, they learned more about the intricacies of working as humanitarian coordinators. Additional comments were noted to enhance the gameplay and rules of the game. It simulates humanitarian action work in the fictional archipelago of Calidonia. The game teaches players on the basics of managing humanitarian missions across several scenarios for example, providing: shelter assistance, food relief distribution, medical missions, and many more. This innovative board game is grounded upon proven methods of simulated play in teaching disaster risk reduction and management to stakeholders involved in the Disaster Risk Reduction Management phases of mitigation, preparedness, response, recovery, and rehabilitation. The game is recommended for users age 15 – up w ith adult supervision for those 14 – below. The development of the prototype would not be possible without the seed grant funding and mentoring from the BEYOND (Be a Young Hero on Disasters) ASEAN PH program of the Young South East Asian Leaders Initiative (YSEALI). Also, the board game was also able to reach the Top 40 semi-finals of the BPI Foundation Sinag Challenge for Social Enterprises which further developed the business model of this creative endeavor. There is now a market demand for producing a commercial release for the board game. Potential platforms for conducting game nights to introduce the game are being explored as well as crowdfunding to jumpstart the production of the board game for private consumers. Also, potential institutional partners are being mapped to conduct facilitated use of the board game during official training for DRRM. ← Where Social Entrepreneurship meets Community Based Resiliency — Enter: Buklod Tao, Inc.